Don’t expect some overblown “Amityville Horror” tale here. Most people can share some sort of story about unexplained phenomena or real-life horrors they’ve experienced. My nuclear family just happens to have had its fair share of them in my haunted house. 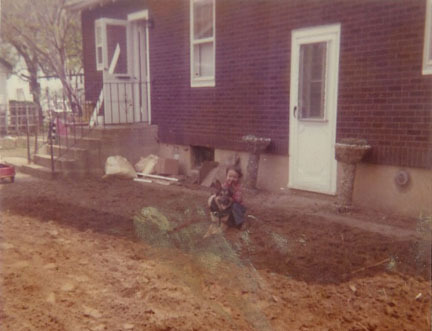 It all started when we moved into a large Long Island colonial on Long Island in 1971. I was just a toddler of two and the oldest of my three brothers was the age of fourteen. Anyone somewhat versed in ghost and spirit lore knows that youth seems to attract these energies, and I firmly believe that. This is my family’s story. A man hanged himself in one of the bedroom closets in our house. There. I said it. Now that’s a way to start a ghost story. Just like in a horror movie, my mother learned this information from one of our neighbors. She soon after learned about an odd symbol etched into the wood over our basement doorway. When a priest came to bless the house, she asked him about it. He hesitantly admitted to her that it signified the house had been exorcised at some point. Second horror movie cliché…Check. Mom had a sense of humor about it and wasn’t spooked, and my father didn’t believe (another horror movie cliché), but my brothers and I were a little freaked. Lampshades would shake and items would fly off shelves now and then. In one incident, while gathered on a bed with my mother watching television one night, we all heard a large piece of furniture rattling in the next bedroom. We expressed our fears, and Mom simply said, “That’s the dog bumping into the furniture as he scratches himself.” We weren’t buying it. 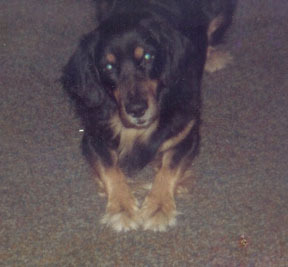 Rowdy, our dog at the time, was lying at the foot of the bed. Dare I even mention the basketball that took it upon itself to bounce up and down in our driveway one evening when my mother glimpsed out the kitchen window? My feisty grandmother babysat her grandchildren once and only once. Moments after hanging a bunch of wet laundry from the rafters in our attic to dry, she was called downstairs by “those rotten kids,” as she endearingly referred to us. Later, she returned to the attic to retrieve the drying laundry…only to find it all back in the laundry basket. She made it very clear to Mom that her babysitting days were done. The ghosts were very protective of my mother. One evening my father came home in the wee hours. Let’s say he was “out with a friend.” No matter how hard he tried his keys in both the front door and the back door of our home, he could not get the locks to budge. The ruckus woke my mother, who easily unlocked the door for him from inside. When my father was finished blowing his stack, Mom simply responded with, “THEY are not happy with you…,” before returning to bed. And that was it. They were gone. It wasn’t her intention, but somehow, my mother had busted our ghosts. 1976 brought our whole town something to fear. The Son of Sam, aka: the .44 Caliber Killer, began his reign of terror in Queens and Manhattan. Our town was two blocks away from the Queens border. My mother was extremely concerned for my oldest brother, a Zeppelin and Kiss fan who had grown his own hair long, as had his girlfriend at the time. 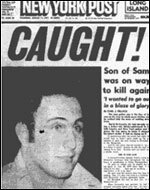 Son of Sam seemed to be targeting young men and women with long hair. I was only seven-years old when the fear of the scary movies I watched on TV was unleashed into the real world. During that first summer of Sam, my mother insisted my brother and his girlfriend leave the house at night with their hair tucked under hats, and would not let any friends or family step out into our front yard during barbecues. If we thought the killings were close to home at that moment, the worst was yet to come. 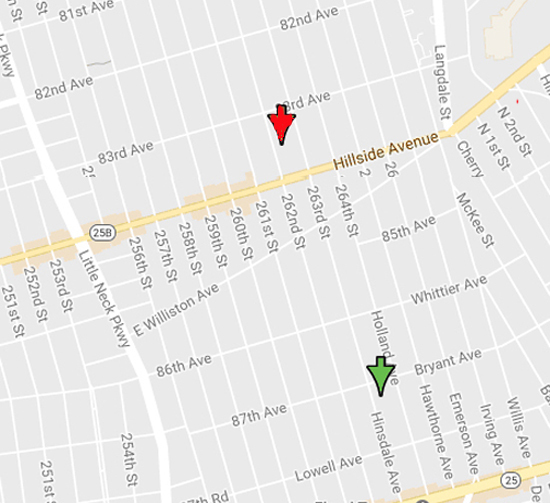 In the autumn of 1976, our family babysitter (who took over after my grandmother’s one-time stint) was shot by the Son of Sam only four blocks away from our home. Fortunately, she lived, but we were left once again without a babysitter. GREEN: my house. RED: location where Son of Sam shot my babysitter. Until I turned fourteen, I shared a bedroom with one of my brothers. This made it disturbing for me, to say the least, when he started to see a man standing at the foot of his bed in 1977. A man with one leg. I never saw the man, but my brother would stare straight ahead in terror, which naturally, terrified me in the next bed. This apparition appeared to him for a series of months, and my mother tried to convince him that the man meant him no harm and must be his guardian angel. On another night, we were all gathered in Mom’s bed watching television (as usual) when my brother suddenly parted from the group. He walked to the bedroom doorway and stood staring into the hallway. Mom approached him and asked in a whisper if the man was there at that moment. His reply was an immediate and firm, “Yes.” Mom never had time to scare yet another ghost from our home. Within a matter of weeks, my brother ended up in the hospital…in the critical care unit…for over a month. He was near death at one point, until doctors finally determined his appendix had ruptured. Needless to say, he recovered and returned home safe and sound. He never did see the one-legged man again. Interestingly enough, when we moved into my house, which had been vacant for quite a few years (shocker), it was equipped for wheelchair access, with a ramp instead of stairs. My mother learned – again from a neighbor – that a disabled military vet had once lived in the house. For a decade after that, our house was phantom-free. But things heated up again in 1987, about six months after my mother kicked my father out of our house. The fault for the return of the paranormal was sort of mine. When I had my first big post-high school Halloween party, I thought it would be fun to use a Ouija board. Let me tell you, that was a catalyst to some serious situations. It was all fun and games using it with my friends on Halloween night: munching on candy, sitting on my living room floor with our legs crossed and waiting with our fingers pressed on the planchette. The party was hopping, with people talking, laughing, and dancing. The board began communicating with us very slowly, and before long, we were asking it eerie questions. The planchette picked up speed. Sure it was giving us all the creeps, but that was our intention. Then my dog, Floyd (named so because we got him in 1980 when “Another Brick in the Wall” was climbing the charts) came nonchalantly strolling through the room, weaving between guests’ legs looking for dropped Halloween treat crumbs. Suddenly, without warning, Floyd lunged for the planchette, teeth snapping angrily. That was the biggest scare of the night for us. I stuffed that Parker Brothers Ouija board under my bed after that Halloween party. My mother was not in the most stable frame of mind with my father gone. My mother dug it out. My mother began to use it, by herself, late at night, after knocking back a few drinks. She came to me after only a few days with concerns about the horrible things the board was telling her to do…to my father…to herself. I told her she needed to stop using it alone in such a vulnerable state. Whether it is spirits or one’s own psyche moving that planchette (the debate will forever rage on), dabbling in Ouija should not be taken lightly. I insisted she stop using it, and stuffed it back under my bed. It couldn’t have been two days later when I was lying on my bed napping when I felt a searing fire of pain shoot into my gut. Almost paralyzed, my mind frozen with fear, I was convinced that the heat was burning up through my mattress from the Ouija board under it. I hurriedly climbed out of the bed and rushed to a crucifix that hung on my wall (always a family staple even though we were not churchgoers). I took the crucifix in my hands and kissed it. Instantly, the burn flushed out of my system. I practically tore up the rug running to my mom in terror. She suggested we remove the Ouija from under the bed and store it under the dining room hutch. Notice she wasn’t yet ready to get rid of the damn thing. Unbeknownst to me, she was still using it when I wasn’t home. Several days later, I was up early for work (my music obsession had me working at a record store by that time). I was the only one awake in the house. I finished my breakfast—toast and a glass of orange juice—and set the plate and empty glass down on the right side of the sink. The swivel arm of the faucet was off to the left. When I came back into the kitchen to take my vitamins after showering, I noticed my empty glass was right where I’d left it in the sink…now filled with water. The faucet was still turned to the left side of the sink. I stared at the glass, confused, until I heard the squealing sound. It seemed to be coming from the next room. The dining room. I crept around the corner with Floyd in tow. The sound was much louder. It was coming from under the hutch. I backed away. Floyd did the same, whining, his head tilting in that cute, curious way dogs’ heads do. I knew that sound. It was the sound of the planchette’s velvet castors running across the Ouija board. Thing is, inside a Ouija board box, there is a compartment for the planchette…underneath the Ouija board, making it impossible for the castors to even make contact with the board. Freaked out, I basically ran from the house and to my musical escape at the record store, insisting to myself that I had been imagining things. Within a matter of weeks, my mother’s obsession with the board grew dangerous, to the point where it told her something so bad (which she refused to tell me and took to her grave) that she threw the board in the trash. Twice. The first time, it popped out of the trash and made a nice dent in her foot. The Ouija monster was finally banished. Several months later, I was sitting with my mother and my sister-in-law around the kitchen table discussing the “Ouija Incident.” I decided it was time to disclose the truth about my auditory experience. Both my mother and sister-in-law stared at me with what seemed to be disbelief as I recounted my story. I read their expressions wrong. They responded with similar confessions of hearing the same exact sound coming from under the hutch. My sister-in-law had her encounter while playing ball with Floyd in the house (Mom always said, don’t play ball in the house). The ball rolled under the hutch. My sister-in-law, not even aware the Ouija board was under there, coaxed Floyd to go after it, which he usually did without hesitation. He refused to go near the hutch. And that’s when my sister-in-law heard the squealing sound and basically fled the room. And of course my mother, so possessed by the power of the board, had heard the sound quite frequently, but simply assumed that she was going a bit loony. That story didn’t end there. 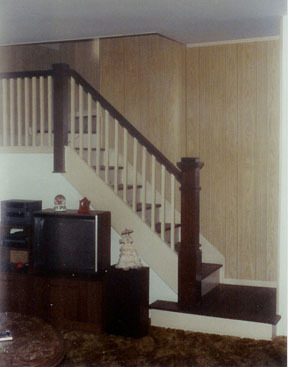 Decades later, when I had some high school friends over to see my new house, we were talking about the days in my old house, and all three friends admitted the house used to scare them when they came over, because weird occurrences would take place, like things flying off walls and shelves. As they flashed back to their fears of my house in the 1980s, we happened to be sitting in the dining room of my new house. Well, guess who inherited my Mom’s antique dining room set. Yes, we were sitting right next to that scary old hutch as we reminisced, so I began recounting the odd Ouija/hutch situation to them. One friend stared at me in shock and then admitted that one time she came to pick me up to go clubbing, and while she sat in the kitchen waiting for me to get ready, she heard that sound and saw Floyd reacting to it. She was so freaked out that she left the house and waited for me outside! Amazing to learn even more previously unrevealed details over twenty years later. Sadly, in 1988, Floyd, an adorable black lab/golden retriever mix and an incredible dog, died of Leukemia. It was my first great loss. We’d gotten him when I was ten in 1980, and I had raised him. We grew up together. Some time in 1989, about a year after he passed, something quite freaky happened to me…which might be interpreted as an episode of night terror based on certain specifics. I’d been having dreams all year long in which I’d be calling for Floyd or running after him, but just when I went to reach for him, the dream would end. On one particular morning I woke from my sleep to see that the time on my digital clock read 6:51. The alarm was set to wake me up at 7 AM for my college classes. I decided I would just rest for a few minutes more. I was lying on my back as I closed my eyes. Suddenly, it felt like there was a huge weight pressing down on my entire body. My eyes flew open. I could see my ceiling in the dark, and I could hear my humidifier blowing on my dresser off to my left, but I couldn’t move my head. I couldn’t move my arms or legs. I was being held in place. And then I felt and heard this scratching sensation, like quick gentle scrapes by a set of nails. They went all around the pillow into which my head was sunk, and then entirely over the blanket covering my body, from my neck all the way down to my feet. At last, the pressure was literally sucked off my body and I felt control being returned to my limbs. Nineteen-years-old or not, I bolted out of bed and rushed to my mother’s bedroom. The time on my clock read 6:53. It had taken two minutes for all of this to go down. I don’t know what the feeling was, but I tend to think that somehow, Floyd had visited me. He had always made it a habit to come get me at about the time I would normally get out of bed, usually climbing up onto it and nudging me with his paws and nose. A couple of years later, I experienced the same exact situation, but it was much less intense, and not nearly as frightening. Eventually, I had that breakthrough dream in which I at last caught up to Floyd and felt him so clearly in my arms that it seemed real. I never dreamed of him again after that, and never had another run-in with the ghostly claws. At some point in the 1990s, my cousin dated a self-proclaimed psychic who could detect paranormal vibes. My mother asked my cousin to bring him over for a visit so he could walk around the house and give a reading. Mom gave him no information about the history of the home. His feelings were quite interesting. There was one small corner in my kitchen that bothered him and made him uneasy (this was one of the walls off which my mom’s knickknacks would fly when my high school friends were visiting). The psychic told my mother the safest place in our home was the dining room, and to go in there to feel peace whenever times got rough (although, I’d still refrain if there was a Ouija under the hutch). However, this psychic didn’t like the doorway to the basement, which was also in the dining room. This would be the same doorway that once held a symbol signifying an exorcism. Finally, the psychic proceeded to the stairway to our second floor. He got halfway up the first landing and stopped. He turned to my mother and told her he could not go any further. She begged to know why. He said not to worry, that there was nothing that would hurt us up there, but he did not want to talk about what he felt and absolutely refused to go any further up those steps. Steps that led to: a bedroom in which someone had hung himself…and a young man was twice pinned to his bed by a phantom dog; a second bedroom in which a one-legged man used to appear to a soon-to-be-deathly-sick little boy; a master bedroom in which large pieces of furniture used to shake of their own accord; an attic in which laundry took the liberty of folding itself. After she got sick, my mother sold our home of almost thirty years to local neighbors just before the new millennium. I often wonder if that family, which included a number of young children, experienced anything out of the ordinary. And with the passing of my mother in late 2003, I can’t help but wonder if she’s returned to the home she’d made so warm for her four boys, a home that had been her fifth pride and joy.